Pastor Ty spoke of our rich Christian history this past Sunday. He spoke of things that we no longer hear or even acknowledge. This country was built from a group of men and women who sought religious freedom. They left the comfort of thier homeland and sacrificed all that they had to follow thier beliefs. 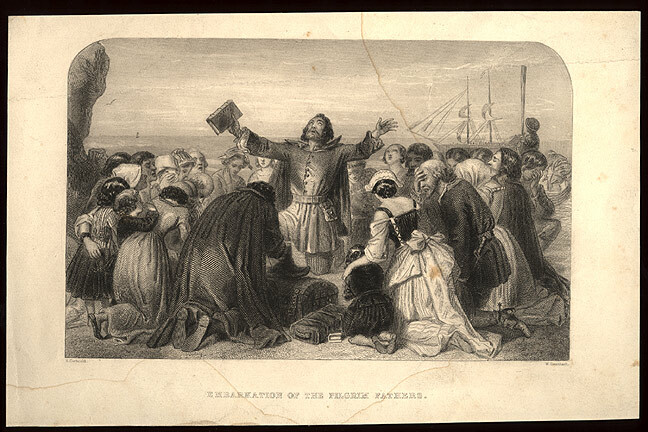 They desired to worship God freely and not under the corrupt practices of King James. 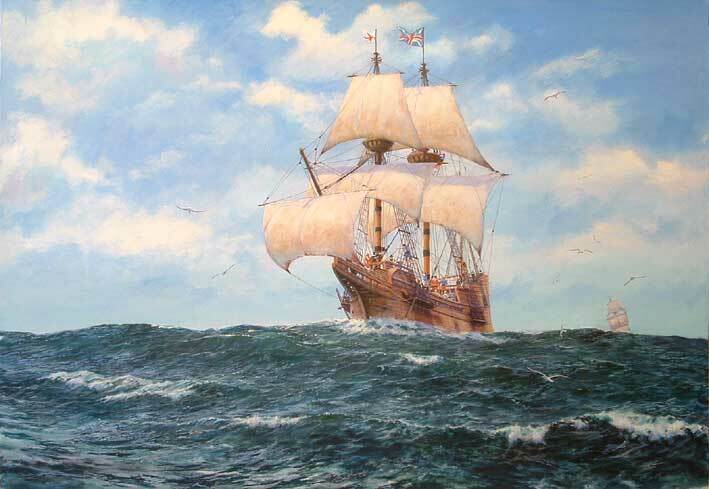 So they fled England and followed thier hearts to a land where they could be free to worship God as they saw fit, as the Word of God taught. 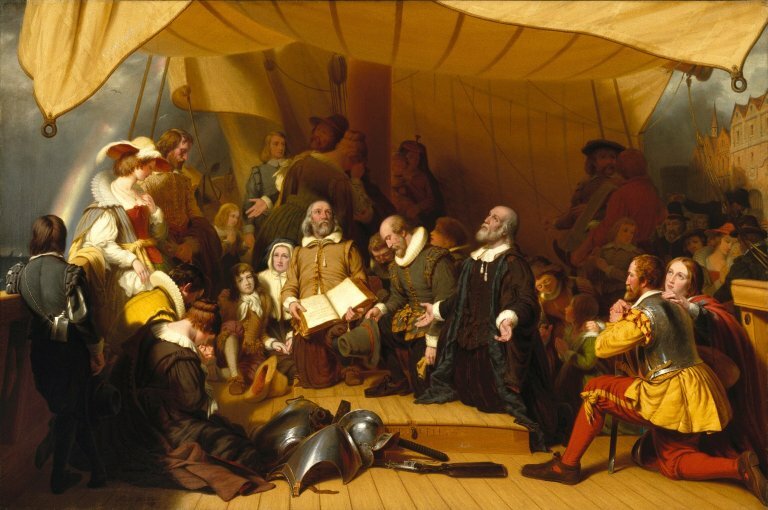 A few words from the journal of William Bradford…a separatist leader aboard the Mayflower. As we approach the 4th of July weekend, let us stop and give thanks for those who have sacrificed everything to give us our freedom. Let us be as firm as they were in thier beliefs and insist that no one take this freedom away from us. Let us give thanks to the God above, Creator of Heaven and Earth for the integrity, the perseverence and persistence of the forefathers of this great nation. Let no man put it asunder. Let us all lift high the cross of Christ and insist that God’s Word be first and foremost in our nation, on our nation’s buildings, on our currency, back in our schools and overflowing in our hearts and homes. 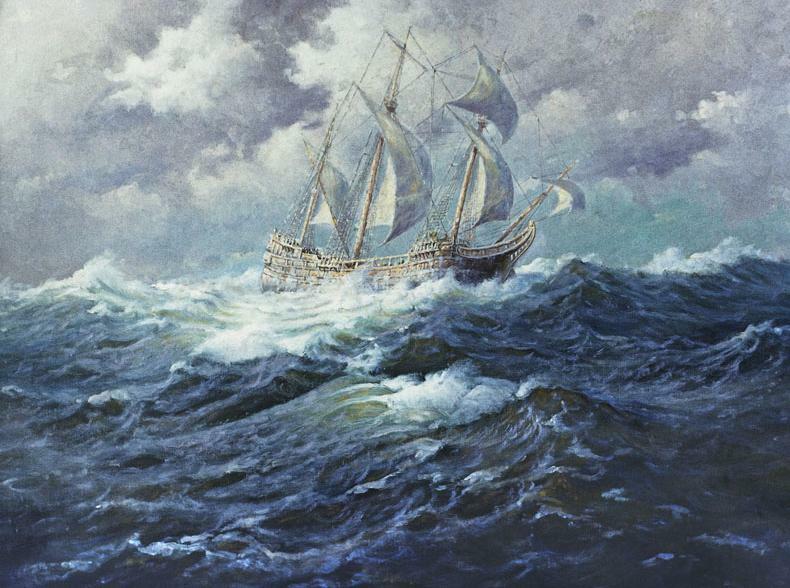 The advancement of the Christian Faith…. Thanks for the reminder Ty…can’t wait for this week’s message! I feel the rev of the engine in my being. in anticipation of the ride to come. we embark on the day’s journey. and smell the sweet aroma of honeysuckle in the air. the pavement is dark and radiating heat. No amount of wind can cool my skin today. where the roads are winding and covered in shade. a bright orange sign warns that “this road is not recommended” for truckers. It is like entering a rain forest-the foliage is thick, green, lush and beautiful. it is a relief to my humid being. I thank God for His creation once again. and I wonder how people can NOT see God everywhere. to change the way I viewed the world around me. The touch of God’s hand. that I am the way I am today. Now He is asking me to do it for others. I’m tired- a good tired. 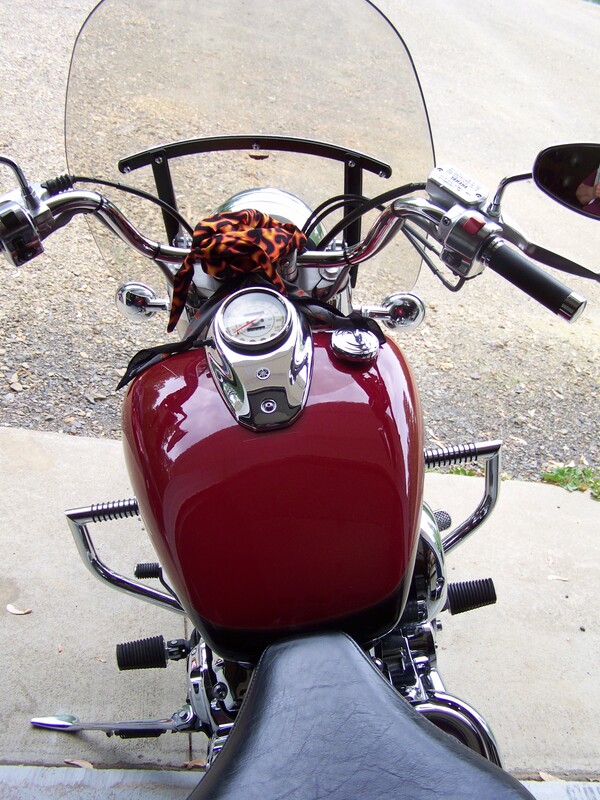 from behind the handlebars of my VStar. to see you in the ride, today, tomorrow and always. as we ride by beeping and waving. not wanting to miss a thing. to help me get where I am today. 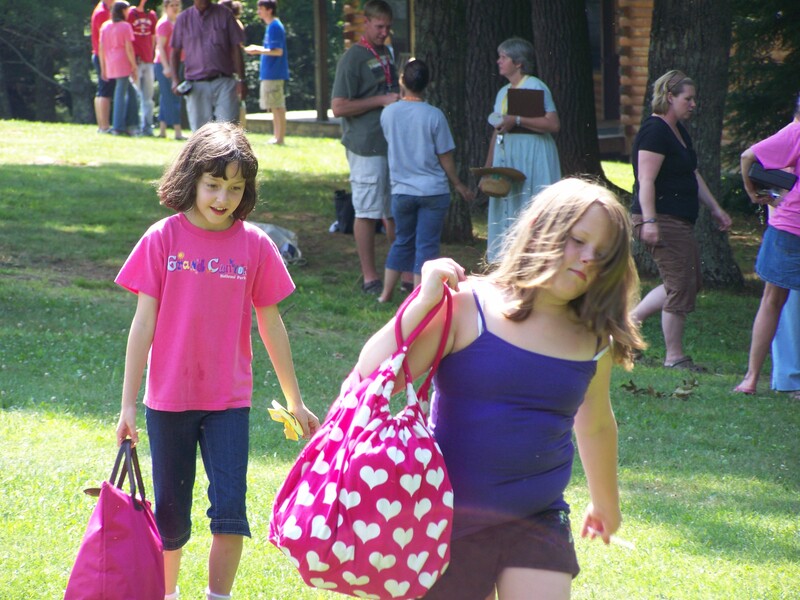 Emily and Elizabeth went to Mountain View Bible Camp in Dugspur this week. Each night they came home with stories from China, Brazil and other places. Emily felt like God was speaking to her through the missionary who had been to China. He spoke about Hudson Taylor and his work in China. Emily was listening and she came home and shared her thoughts with me. I was kind of blown away by her words. 9 years old and recognizing God’s voice through this missionary. Wow! 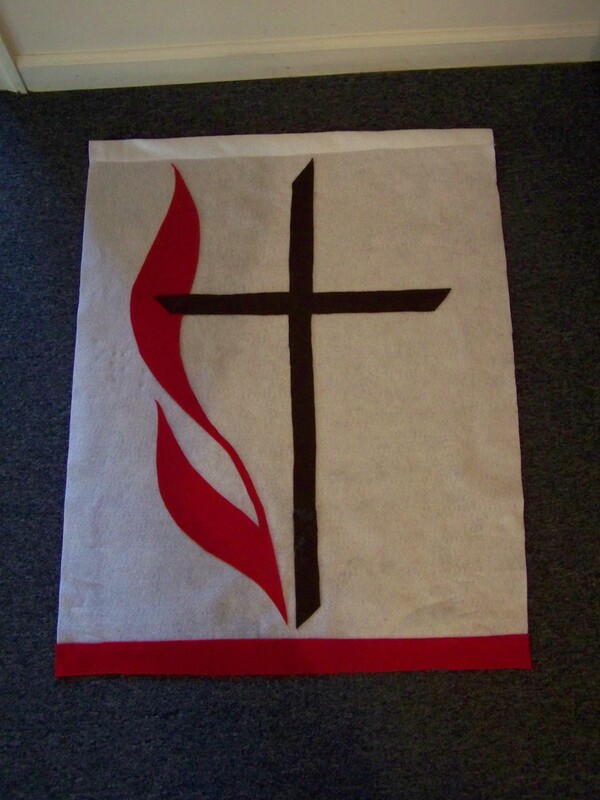 This was our first banner! Thank you for including me ladies! I can’t wait for the next one! Hi! 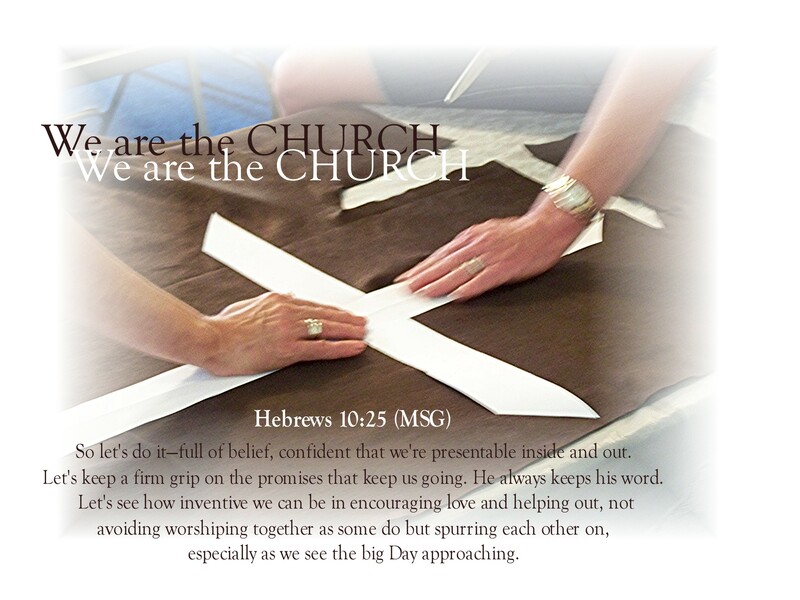 In the next post you will see pictures of how we are the church-outside of the church walls. This past week I had the opportunity to help Pastor Betsy King carry on a tradition of FUMC Hillsville with the folks of Bethany United Methodist Church in Austinville. 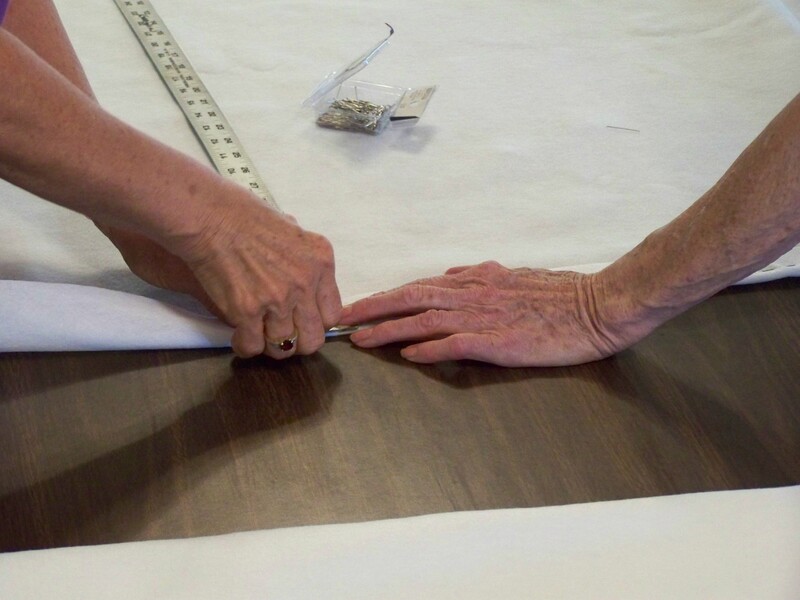 Making banners. Back in the Spring Pastor Betsy had her first baptism in the sanctuary at FUMC Hillsville. The person being baptized was from the Bethany Church. Since they don’t have a baptismal- Pastor Betsy used the one at Hillsville. So, the folks at Bethany came to the sanctuary at FUMC Hillsville and held the baptism there. 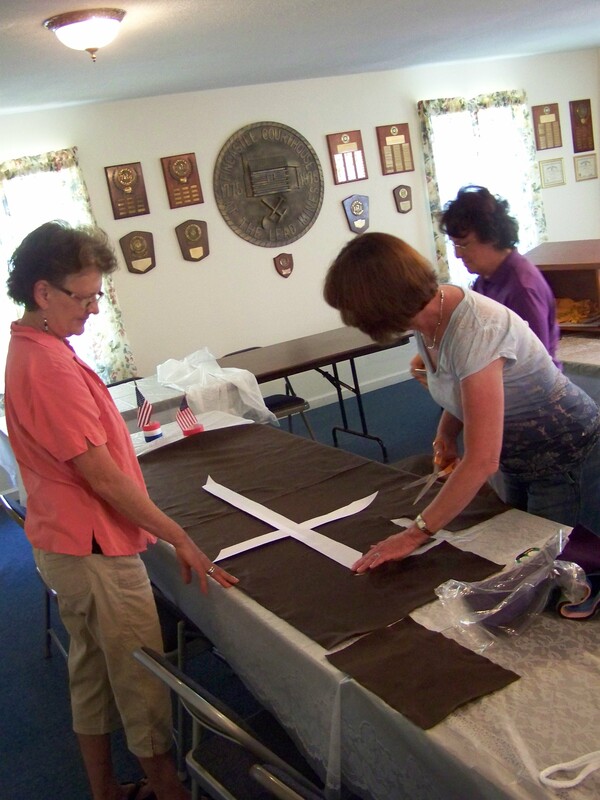 While there, they were admiring the banners and the communion table “dress.” They were told that the banners were made by our own Virginia Pratt and they were then inspired to create some of thier own. 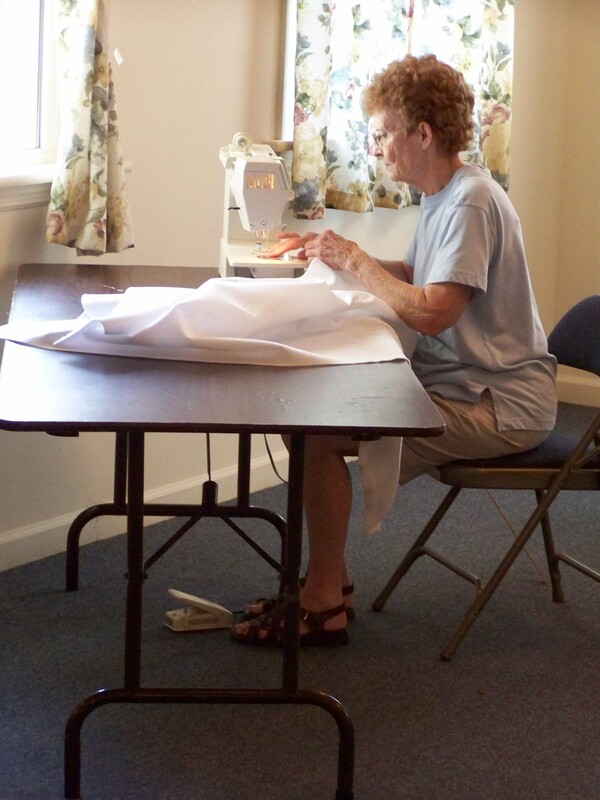 This photo was taken during a recent banner session with the folks at Bethany. This is a beautiful representation of how we are all one in Christ. The folks at Hillsville along with the folks at Bethany. Pastor Betsy is the link and Jesus Christ is the key. I love the way the hands come together at the center of the cross. Just beautiful. I have been blessed to be a part of this fellowship with these precious children of God from Bethany. This is one way we are the church outside of the church- when we fellowship with others beyond Sunday morning. 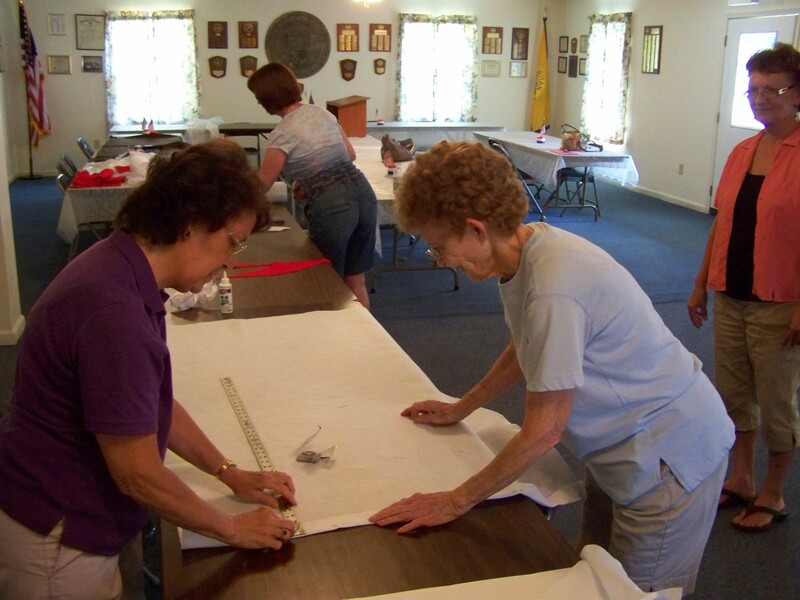 Virginia Pratt will be pleased to know that her legacy of banner making lives on in others. Blessings upon you! Last night I had the opportunity to work with some of God’s precious children. I drew a picture from Slovakia and then explained what it all meant. 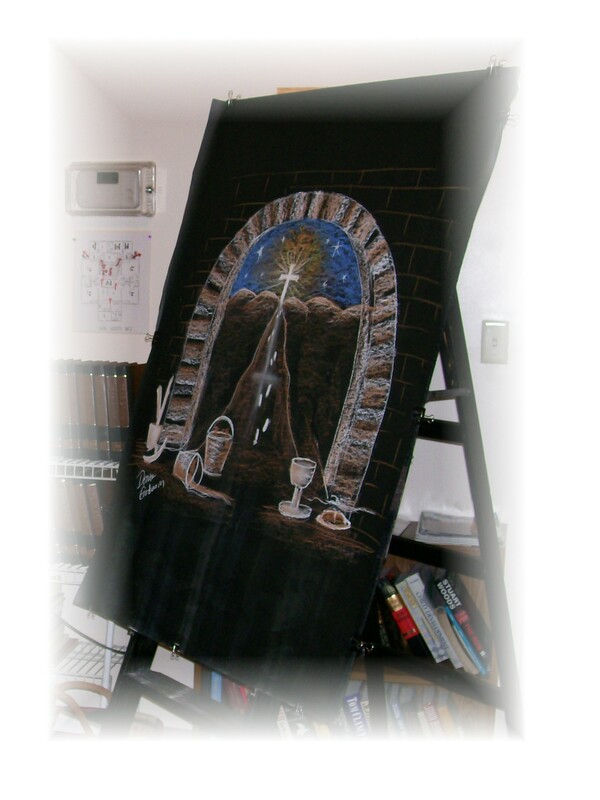 I played music from Point of Grace as I worked and I explained that Point of Grace’s music was all about “telling our life story.” Part of my story is to tell about God in the images that I draw. My trip to Slovakia will stay with me forever. It was full of many, many “firsts” and I learned a lot about myself, God and the world. God showed me who HE is and what HE can do as I took a giant step of faith. It was more like a leap! While I was there He told me time and time again that He was with me and He was in control. All of God’s children need encouragement and this is what my “mission” was for the evening. Paul encouraged millions of followers through his letters, letters that are still encouraging people today. When we read Paul’s letters they start out with greetings of love and end with peace and grace. I think that is beautiful. Paul fits the hard stuff in between the sweet. Kinda like a backwards oreo cookie! The filling is on the outside with the hard cookie on the inside. Life can be hard and unfair and for some people it is downright miserable. Just as God used Paul to encourage through letters, He is using me to encourage through art. All of our lives are a journey and the roads we take are our choices. God gave us free will to make decisions. For me, I decided to follow Christ a long time ago. This picture is a story about my faith walk. But it could be anyone’s story and God enabled me to use it to encourage His children and leave behind the HOPE we have in knowing Jesus Christ as our Lord and Savior. Some of His children have had to make tough choices in order to just survive and in making these choices they have found hope, peace and love. Life is still hard, but God has made them into overcomers. The archway is one of many that I saw while in Slovakia and when I agreed to the mission trip, I stepped through this archway and began another leg of my journey towards Christ. These precious children that I met are also on a new leg of thier journey. A fresh start filled with hope, love and peace. No, it’s not easy, but it’s the right road and the road that was built for them by Jesus Christ. As I looked into thier eyes I saw a hunger for God’s love. I saw fortitude, courage and bravery. I felt compassion, kindness and love. As I explained the drawing, I saw understanding fill their eyes, I felt the God of HOPE in the moment and I felt my heart beat a little faster. The buckets hold life’s debris, junk, stuff. The shovel and pickaxe are the tools used to get rid of the debris. We cannot move forward, through the archway to life, until we rid ourselves of this junk. The chalice and bread are how we remember what Christ did for us. When we take of these elements, we commune with the Almighty. It is an act of reverence, of love and of commitment. We cannot take these things until we seek repentence. At least we shouldn’t. We should go to the table with a clean heart. Each colorful footprint represents one of God’s children. He knows thier names and thier future and He loves each and everyone of them. 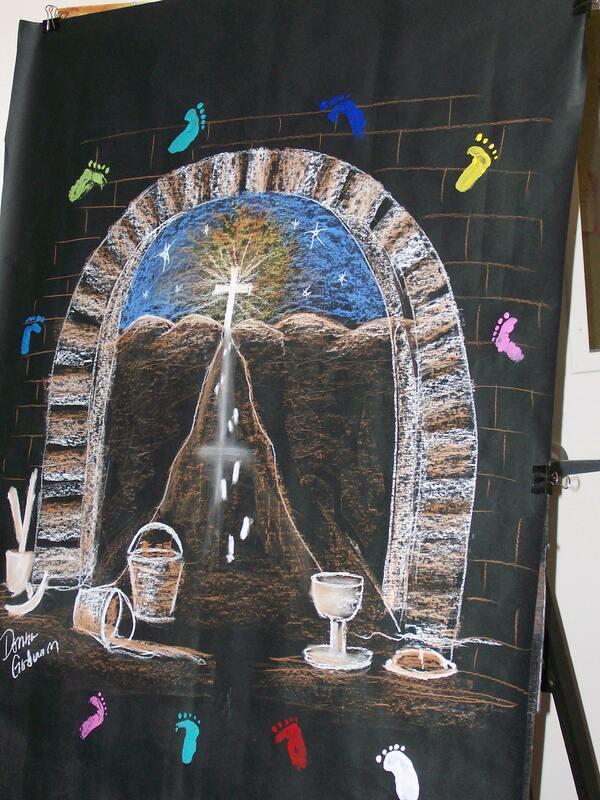 When I invited them to be a part of the drawing, by adding thier footprints, it changed the whole piece. It added color, life, love and hope. We MUST do this with everyone we meet-invite them IN- into whatever it is that God is doing through you. No one wants to feel like an outsider. Everyone wants to belong. Now this drawing belongs to all of us. God is at the center. He is the Life, the Truth and the Way and we cannot make it on our faith walk without Him. This is for Emily, Elizabeth, and Lydia! Goodnight Girls! I love you! 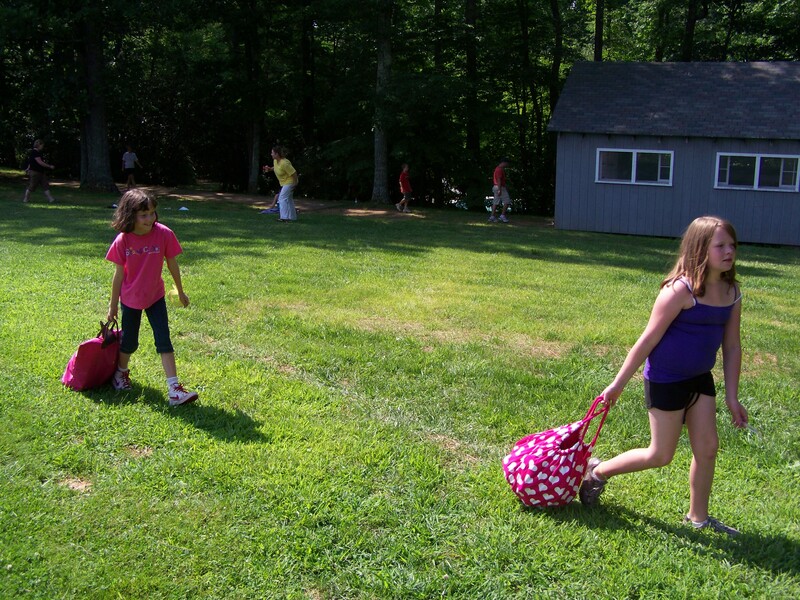 Emily and Elizabeth started day camp today. They had a super busy day and were tired out on the way home. Elizabeth shared with me that she “checked out my blog” the night before. She said she didn’t have anything else to look at so she decided to “check it out.” I know she has looked at it before when I posted pictures of her Sunday School class. She is probably my youngest reader and I am humbled to know that she even takes the time to look at it. Thank you Elizabeth! I am really glad she told me that she looked at the blog because it only enforces the fact that we must guard our hearts, minds, words, actions and deeds and honor Christ in everything we do- including blogging. Elizabeth’s candid remarks reminded me that “people are watching us.” When a 10 year old tells you they are reading your blog it’s kind of like a ‘wake up’ call! Kids see more than you think! God sees everything and nothing is hidden from Him. We are to guard the good deposit that God has placed in our lives. HIM! We are to keep everything about us HOLY. ( even blogging, facebooking, texting and driving in traffic- to name a few) Why? Because we love the Lord with our entire being. Because we are compelled to do this by GOD Almighty Himself. Our faith doesn’t stop when we receive salvation-IT BEGINS!! It is a process that will be ongoing as long as we breath the air of this world. We are to guard the treasure ( salvation) with our life. We do this with the help of the Holy Spirit and sometimes the HS uses people to get our attention! People like Elizabeth- a 10 year old! 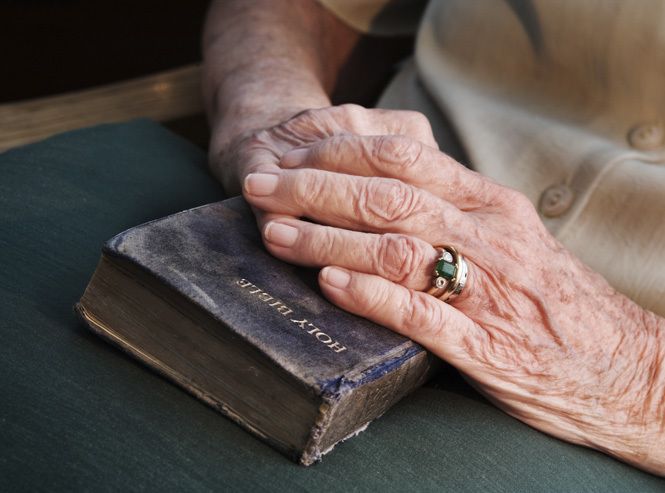 2 Timothy 2 : 14-18 ( MSG) Repeat these basic essentials over and over to God’s people. Warn them before God against pious nitpicking, which chips away at the faith. It just wears everyone out. Concentrate on doing your best for God, work you won’t be ashamed of, laying out the truth plain and simple. Stay clear of pious talk that is only talk. Words are not mere words, you know. If they’re not backed by a godly life, they accumulate as poison in the soul. A Godly life. A Holy life. The Best Life- a life in Christ. The WORLD is watching and they are taking notes. Life notes. Just like a song is out of tune when it is missing a note-our lives are the same way without Jesus in EVERY ASPECT of our lives. Yeah, it’s hard and it makes you re-evaluate-and re-prioritze and it even makes you feel like an outsider because now you are different-not better- but different because now you KNOW better-you aren’t marching to the tune of the world-but to the heartbeat of YOUR Creator! God gives us a spirit of power, love and self discipline! Are we using it? Are we hearing the heavenly drummer or the noise from the world? God used Elizabeth to get my attention today. Thank you Lord, I long to see your salvation and to live forever with you in Paradise. You have burdened me-spiritually, physically and emotionally with the ongoing challenge of living a life that is HOLY and PLEASING to you. My life has not been so HOLY or PLEASING in certain areas. You know what they are. I am filled with shame and regret that I have not been as holy and pleasing as I should be. I ask foryour forgiving touch upon these areas and I thank you for the grace that comes from you and only you. It is ever flowing and over flowing and right there for any and all who seek your forgiveness. May I move forward from here and be the servant you have called me to be. I know I will never be perfect here on earth and I long to do what you require in order to be rescued. To live a Holy life. A life that revolves around you in ALL areas, not just the areas I pick-but in every nook and cranny of my being. I can only do this through your power and might and I ask these things in your Holy and precious name. This afternoon we rode to Christiansburg to my sister’s house for a cookout. We got there, we ate and then Cort said, ” it’s gettin’ dark-we better roll!” We were on the bikes and he didn’t mean dark as in night time-he meant the sky was getting dark with a storm. So, we hopped on the bikes and decided to take the long way home to avoid the storm. Well, sometimes you shouldn’t take the long way home -instead- you should stay parked for awhile in the safety of a warm and dry house. You should never try to out guess mother nature! We went the long way around and I was tickled with glee at what ran out in front of us early in the ride- a baby black bear! He just sort of gallumped across the road ( yep- I made that one up!) and went up the side of a bank, disappearing into the woods. So, naturally when you see one you start looking for another one! Well, I didn’t see another bear but I did see that calf in the driveway again! We got to Floyd and the sky was looking even more ominous than before. It seems that the storm was coming right for us-or we for it. So we headed down 221 and the lightning was cracking all around us. It was more like heat lightning at first-way up high in the sky. The farther we rode-the lower it got. The air was thick with bugs and at one point Corynn and I saw a field of lightning bugs-it was beautiful! By this time it was dark. We don’t normally ride after dusk as it is dangerous. But we had to get home. Well, once we got into Dugspur- the rain started. I was in the lead and the rain got so heavy that I had to pull over and into a driveway. We were soaked to the skin! It let up a little and really all you can do is press on until you find a safe spot out of the storm. So we did. We ended up taking cover at Hillsville Elementary School under the front doors. About the time we turned into the school a big bolt of lightning lit of the sky and we were off the bikes and under cover! Phew! We have super kids and they were so brave! I am so proud that they kept thier calm and looked at it like an adventure. Cort told Emily that ” this was better than a theme park ride!” haha! She told him it was “creepy!” haha! The rain let up and we were able to get on our way after 10 minutes or so. We arrived safely at home, very wet, and very thankful. We had a thanksgiving prayer huddle in the garage-dripping wet jeans and all! Thank you Lord for your hand of safety upon us! Our evening ride reminded me of the old song by Supertramp_ “Take the Long Way Home.” So here it is for your listening pleasure! As I sit here and look out the studio window- I see the Creator’s mighty sun rays gleaming through the wet tree limbs. As the summer rain drips from the leaves onto the glistening grass I think of the everflowing grace of God. It’s always there, ready to cover us, to fill us and to nourish our parched souls. My heart is drowning in God’s amazing grace this morning. I visited Flat Rock this week and God has used that precious little white church perched on a rock, to touch my soul once again. There’s something about that place that speaks to me very deeply. It’s simplicity says, ” I am all you need, Donna. No glitz, no glamor, just Me.” I felt this in Slovakia too. God has spoken to me in both places about “comforting” His people.